Home / Center News / “Controversial” Ads? We Don’t Think So. Like much of the US, our community has been hit hard by the opioid epidemic. In Virginia last year, over 800 people fatally overdosed. The epidemic has reached a point where most of us know someone who has been affected by it. Just this past year, Virginia is taking steps to address this public health crisis by opening a limited number of syringe exchange sites throughout our state. Syringe exchanges have been proven to lower infection rates (HIV in particular) by as much as 80% among injection drug users. 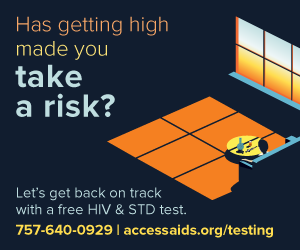 Our current STD/STI testing campaign tackles this epidemic head-on, asking people to consider whether getting high has made them take a sexual risk that should lead to getting an HIV/STI test. Drug use, and abuse, comes in many forms, be it alcohol, tobacco, marijuana, pills or injection drugs. 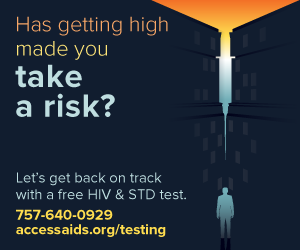 The ads we are running, while bold and progressive, address real issues that real people in our community face, and does so in a way that subtly suggests whatever your drug of choice may be, LGBT Life Center (formerly ACCESS AIDS Care) offers a non-judgmental environment to take control of your health. We encourage families to have an open dialogue about the consequences of drug use. 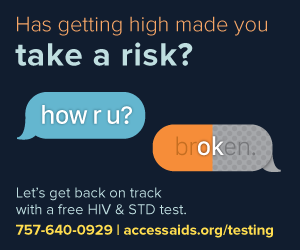 Additionally, we believe these ads are subtle enough to speak to those who are familiar with the materials necessary to partake, but will have a very limited impact on those unfamiliar with these issues and challenges. The photograph in this article is taken from a very particular vantage point. However, in person, the ad extends beyond the camera lens to a full 24 feet wide. Anyone seeing this ad in person, as it is intended to be viewed, would take in all of the advertisement, not just any one particular element. We believe the ad, and all ads, are best interpreted when fully viewed. We encourage WVEC/Channel 13 to post the ad in full.